IMHO, this option should be left unchecked, because even if in a few cases it can avoid you to break on exception that you don’t care about, it hides EVERYTHING happening outside your code, so you miss all exceptions in every third-party framework. Now you’re ready to add your breakpoint (at the opposite of what said Aaron Lerch in his excellent post, you don’t have to configure symbols to break in some managed function, the CLR can handle this by itself). Let’s say that we want to break on the function ToString() of the built-in type String, whose full name is System.String.ToString. If you didn’t make a mistake on the function name spelling, you should break on each call of this function. Just check that you got the full red circle next to your newly added breakpoint in the Breakpoints windows. This is way more difficult. First, you HAVE to retrieve the symbol of you module. You can do whatever you want, without a symbol file you’re stuck. 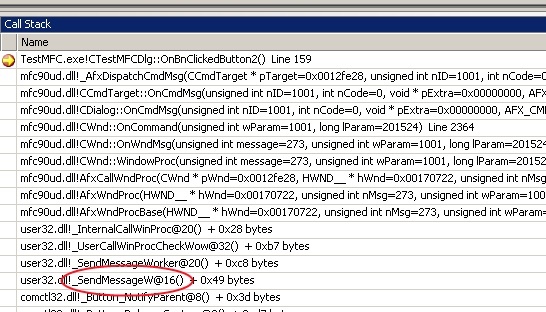 Here you can see that the name for Visual Studio waits for: _SendMessageW@16. Lucky boy, you can go straight to the next paragraph. The long-awaited name is written at the beginning : _SendMessageW@16. We did it! Ok I got the decorated function name, what’s next? If you’re brave enough, Visual Studio can be used to accomplish the same work than WinDbg…but sometimes it’s a pain. 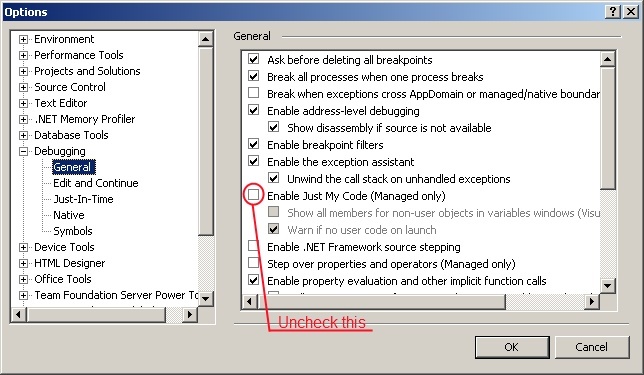 I think this trick is useful when you already have a Visual Studio attached to your software, or when you want to teach some debugging tips to developers who don’t want/like/use WinDbg. As a friend told me, “sometimes it’s better to improve the use of an existing tool instead of learn a new one”. I let you decide! There is a slightly simpler way. nice trick max630, tks ! @max630 thx for the trick… that is insane…! Is there a way to just specify an offset to a function address? Say, the location when it is about to return so I can output the returned value?